Get at that wet fish meat, folks! Let’s say you’re a company that specializes in marketing a soggy pink mush meant to provide protein. For years everyone has accepted that eating a soggy pink mush that provides protein is incredibly good, and you’ve sold your mushy protein supplement successfully for a long time. Then, all of a sudden things change and a new generation comes along, and get this — that generation doesn’t want the pink mushes that their parents once ate! Heck, they don’t even know how to open the can that looks exactly like a cat food container that the food comes in! Can you imagine such a dilemma!? Well, it’s the dilemma faced by one of the most powerful industries of them all: the canned tuna fish industries, which blamed a 40% drop in their tuna fish sales on millennials not wanting or not knowing how to use can openers. The product is so appetizing that must be the only reason. Seizing on this piece of news Kimmel wanted to test things out, and sent a correspondent down to Hollywood and Highland (where the show is taped, folks!) in order to test out Big Tuna’s Big Theory. 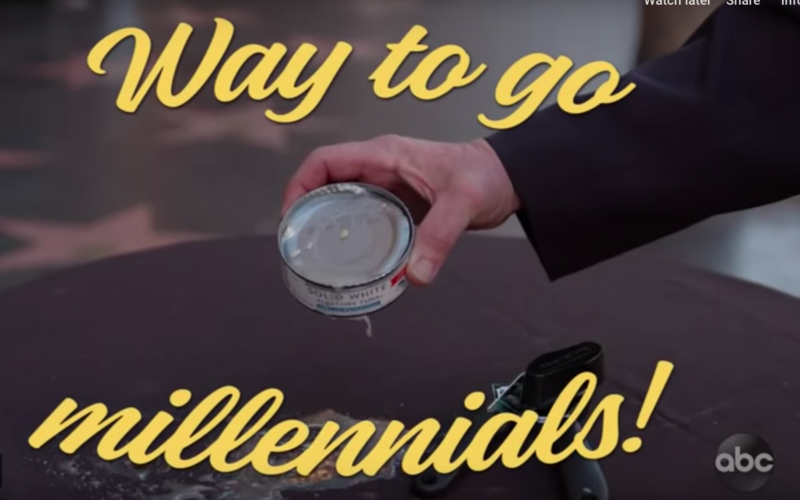 Millennials are approached and handed the can opener with the can, and the gauntlet is thrown: can these younger people open up this can of tuna? Can they? Oh, can they!? The results… are mixed. Some can barely connect the can to the can opener. Some have such a hard time with the device that they end up breaking it open. When another can opener comes, they break that one too. One millennial want to give the knife a spin to open the can, that the correspondent inexplicably has on hand, but he is denied his request. One woman however opens the can up easily, while guess correctly the premise of the segment. So when it comes to the opening of pink wet meat, the new generation isn’t all bad. Good luck, oh good people of Sunkist Tuna! Good luck! 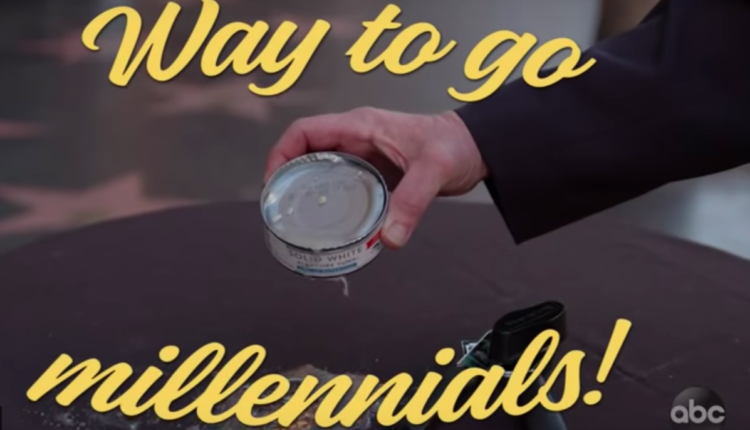 What did you think of millennials and their ability to open cans of tuna? Let us know in the comments or on Twitter at @WhatsTrending.